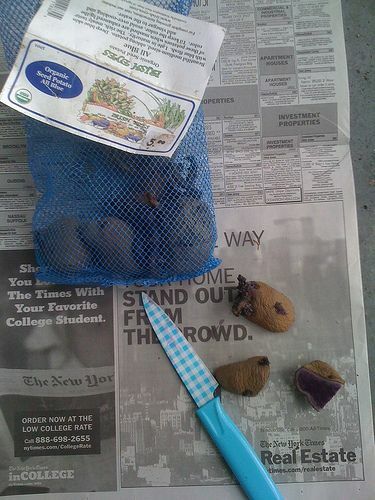 Demonstrating how to roll up the sides of the bag -- even though these are just planted! And now it's time to get growing -- keep us posted on your bags! Tried growing potatoes in containers (ca. 36 inch high) this year and the yield was low compared to what I had hoped for. 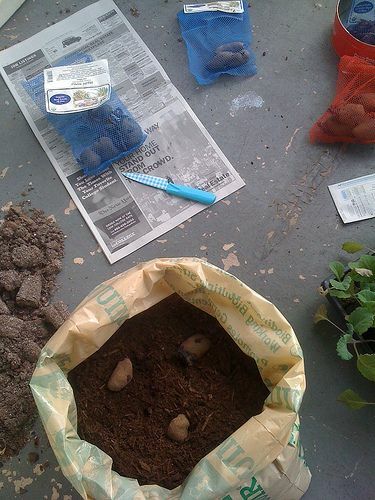 I used a couple different varieties of seed potatoes and the plants grew up as I added more dirt and looked great, but the only potatoes I got were down in the very first 6-12 inches of soil; nothing above that. 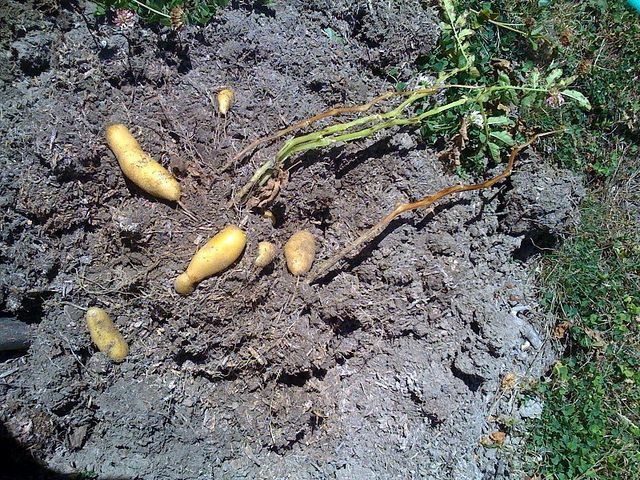 Had a lot of miniscule roots shooting off the main stems as the plants grew up but these didn't send out more tubers. Any ideas on what I may have done wrong? khollander I am a keen kiwi girl now living in Norway and have had to adapt to the minimal and unlabelled seed variety here. As such I couldn't find seed potatoes labelled any further than early or late harvest and ended up using organic ecological potatoes from the supermarket for seed potatoes. They took a little longer than other taties to grow eyes ready for planting - but have produced a much better crop than the other non organic potatoes I used. I was curious about using purchased organic seed potatoes. Is there an advantage to using these? 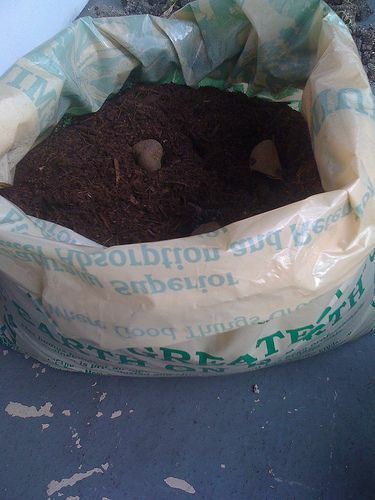 I've been growing potatoes in bags and trashcans for a couple of years now and have just been using organic potatoes from the farmers market that I purchased for cooking but had started to spout. Hello! 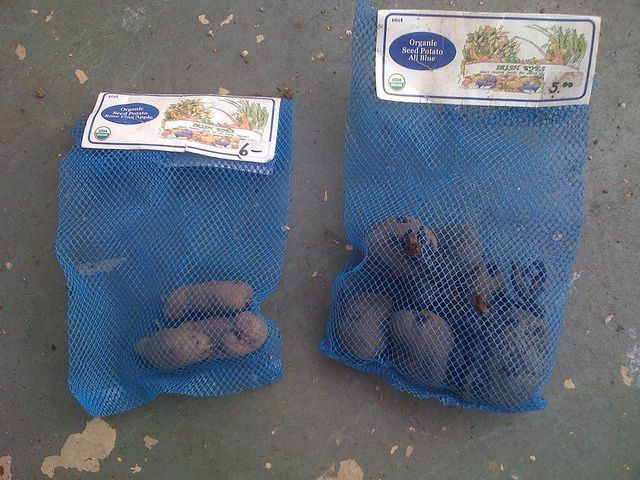 Most sources will recommend organic seed potatoes because they are not treated in any way. 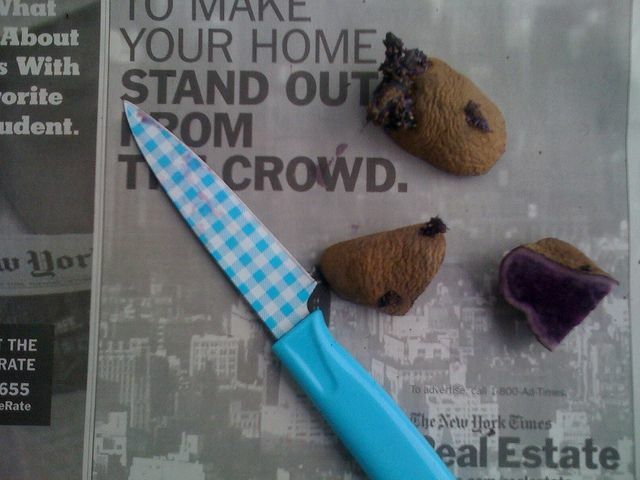 I'm betting organic farmers market potatoes are just as great! 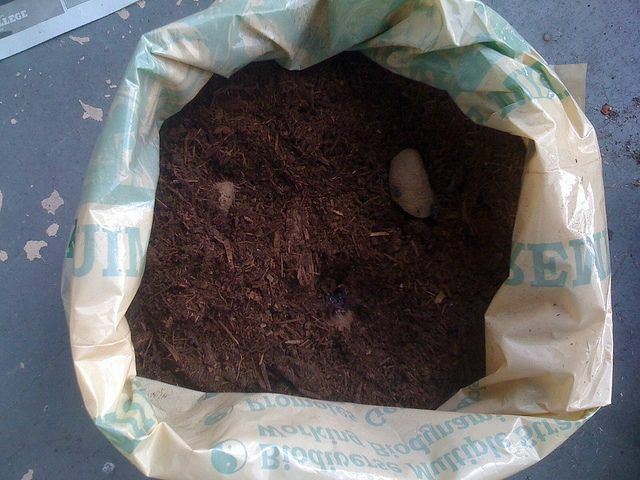 Another option I've used is the cloth "grow bags" available from nursery/greenhouse suppliers. I empty them at end of season & reuse each year (going on 4 years w/same bags). Great article & the only way to grow taters in a limited space garden! 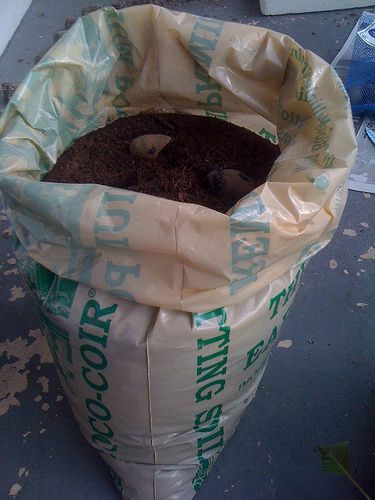 What size burlap bags do you recommend I ask my local coffee roaster for? Yes, exactly. Just ask your roaster - they're all about the same size - 2 feet across and maybe 4-5 feet deep. Will let you know how my potatoes will taste 60 days or so ! Great article ! Thank you so much Amy, you just demystified growing potatoes. Good to know I can grow in pots and bags. Potatoes are something I have been wanting to try for awhile - alas I think I need to wait for fall, we are hitting the 90's every day already! But now I know what to do when the time comes - so THANKS!!!! Love this post. Potatoes are one of my favorites to grow. I buy all my seed potatoes from this site: http://www.potatogarden.com - recommended by Cynthia Sandberg, the owner of Love Appe Farms (the kitchen garden of Manresa in Santa Cruz). Thanks for the rad tip! I would put 4 seed pieces in a bag that size. 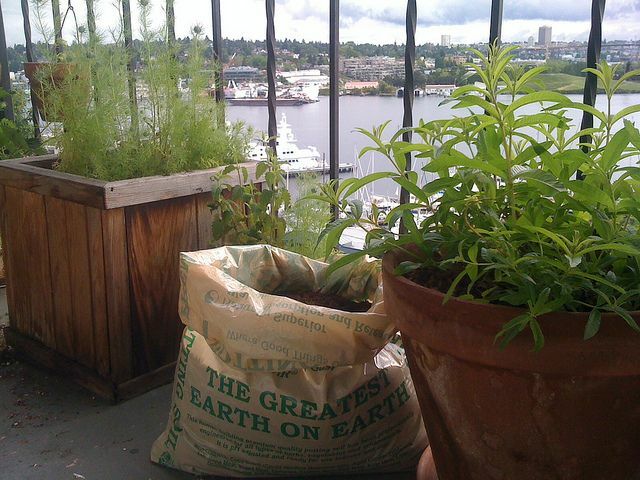 You can check out this awesome post on Mother Earth News for when to plant in your region: http://www.motherearthnews.com/Organic-Gardening/What-To-Plant-Now.aspx. Maturity times vary significantly - some 45 days, others 110, so choose according to your priorities. As for How many the plant will produce, this depends on weather, timing, variety, fertilizing, watering, etc. Too many variables to guess correctly. I'd say 3 or 4 handfuls a plant. Well, thanks, Antonia!! I love that one million times. And good on ya for raising men that cook - world needs more. Someday, his spouse is gonna LOVE you! What a super cool plan!